Where: Carbondale Recreation Center and Davi Nikent, Center for Human Flourishing host wellness activities and tables at the Carbondale Recreation Center, 567 Colorado Avenue. We invite wellness businesses on Main Street and in the periphery of downtown area to participate – see How below. Why: We celebrate the programs, businesses and individuals in our community that provide services and goods focused on well-being. 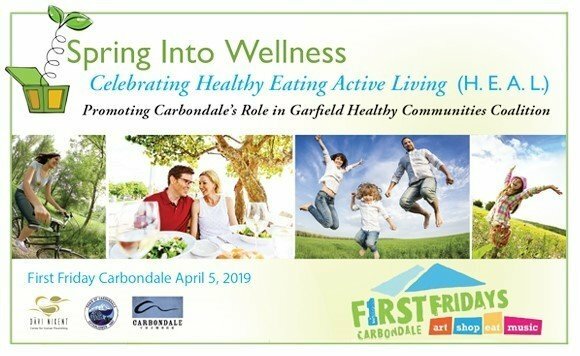 Collaboratively, we will raise awareness of all the wellness opportunities that are available in Carbondale and encourage people to access products and services that promote health and happiness. Who: Wellness practices (all and every type), Community Gardens, Coffee Shops, Physicians, Chiropractors, Naturopaths, Restaurants, Bike Shops, Sports Businesses, Gyms, Fitness Centers, Health Coaches, Nutritionists and more. What would you like to bring to the table? Do you have wellness types of events planned for this summer that folks should know about now? Springtime Specials? How: Host an open house – offer specials – put a poster in your window promoting the event – share with your mailing list! Sign up for a table at the Rec Center to display your business information. Ask about being a co-sponsor. We have created a google map with participating business locations to print out as a guide for folks walking or riding their bikes around. Let us know if you want to be on the map! YOU? Fee to be listed as a sponsor for the event is $25 to cover expenses of newspaper ad, flyer printing and handouts. If you want table space at Carbondale Rec Center the fee is $10. ($35 total) Your business will be listed on webpage with your logo as participant for the event and your business location will be added to the Google map.